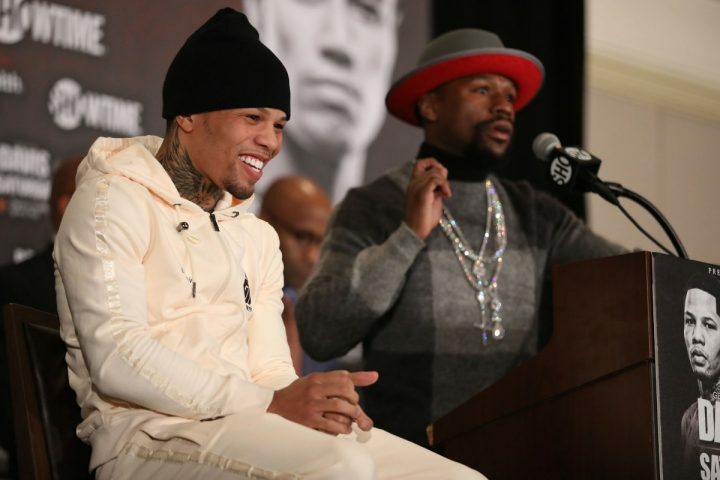 By Jeff Aranow: Floyd Mayweather Jr. was wearing his promoter hat on Thursday in talking about Saturday’s fight between his fighter WBA Super World super featherweight champion Gervonta ‘Tank’ Davis (20-0, 19 KOs) and challenger and former super bantamweight champion Hugo Ruiz (39-4, 33 KOs). Mayweather noted that Ruiz has 18 first round knockouts on his record, and he sees him as being more powerful than Abner Mares, the fighter that he replaced for Gervonta’s opponent on Saturday night on SHOWTIME at the Dignity Health Sports Park, in Carson, California. “I think this fighter is more dangerous than Abner Mares,” Mayweather said about Hugo Ruiz. “I also think Abner Mares is a hell of a fighter. It’s all about taking chances and taking risks. All he’s done is beat the guys that we’ve put in front of him. I want to see him do good,” Mayweather said. Davis gives Mayweather a potential future PPV attraction, but it’s not going to happen without help from him in being matched against better fighters than Abner Mares and Hugo Ruiz. There’s no pressure on Ruiz in this fight. Since he’s considered to be the token lamb for Davis to slaughter, he can go out there without any pressure on him and swing for the fences from the opening bell, looking to score a big upset. If Ruiz loses, it won’t be a big deal, because he was never expected to win the fight in the first place. Ruiz fights well when the spotlight is on him, and this is going to be a big deal for him. You kind of have to ignore Ruiz’s defeats from several years ago, and look t him as someone who is at the top of his game still looking for another big win. Mayweather is right. Ruiz, 32, is much bigger puncher than the 33-year-old Abner Mares, but he’s not much younger, and he’s facing a guy with excellent power and speed in his own right in 24-year-old Gervonta. Ruiz has a lot of early knockouts on his resume, but if he doesn’t get to Davis in the first couple of rounds, he not get a chance to use his massive power. Ruiz is vulnerable to big punchers himself in having been stopped by Julio Ceja and Hozumi Hasegawa in 2-2015 and 2016. Ruiz avenged his loss to Ceja by knocking him out in the 1st round in 2016. Ruiz hasn’t lost a fight in three years since his 9th round stoppage defeat at the hands of Hasegawa. “Ruiz is a hell of a fighter. He’s a tough competitor,” Mayweather said in paying his respects to Hugo Ruiz. “He’s a former world champion, so he’s not a pushover. Tank, every time he comes to me, I say, ‘Who do you want to fight?’ and he says, ‘It don’t matter.’ So he don’t pick and choose. If you want to criticize anybody [about Gervonta Davis’ opposition or lack thereof], then criticize me or criticize Leonard Ellerbe. For years, they criticized me from the beginning…These writers are going to write good about you, and write bad about you. As long as they write about you. Ruiz, you’re a hell of a fighter. He’s a tough competitor. I’ve seen you fight. Good knockout power too. 18 knockouts in the first round. [Turning to Gervonta] We can’t knock you, because you only had 20 fights. Hell of a match-up,” Mayweather said about the Davis vs. Ruiz fight. Well, there are boxing fans aplenty that are upset at the match-making that Mayweather Promotions are doing for Tank Davis. Even before Abner Mares pulled put of Saturday’s fight with Davis due to an eye injury, people were upset at the match-up. The fans want to see Gervonta put in with the young lions from super featherweight division, not the aging lions from the featherweight division. Ruiz, 32, and Mares aren’t old by any means, but they’re also not young and neither of them fight at super featherweight. The fans don’t want to see aging over-the-hill fighters that don’t belong at 130. They want to see Davis fight guys like Alberto Machado, Tevin Farmer, Miguel Berchelt, Vasyl Lomachenko and Masayuki Ito. If Gervonta is going to be fighting featherweights, then the fans want to see him facing Leo Santa Cruz, Oscar Valdez or Gary Russell Jr. In other word, guys that are still in the prime of their careers, and not on the downside playing out their strings. “I can say with confidence that I can knock out Gervonta Davis. No fighter is invincible and that’s a really possible outcome on Saturday,” Ruiz said. If Ruiz lands enough of his bombs, he can certainly knockout Davis. Whether Ruiz lasts long enough to deliver his payload is the tough part. He’s going to have to take a lot of heavy shots from Gervonta for him to get to the point where he can hurt him with one of his own big shots. Hugo’s power hasn’t abandoned him, but it might not carry up with him to super featherweight. Ruiz just moved up from super bantamweight to featherweight in his last fight against Alberto Guevara (27-4, 12 KOs), and he was forced to go the full 10 rounds with him. That’s not a good sign that Ruiz couldn’t KO Guevara, because he’s been stopped before by Shinsuke Yamanaka. Ruiz now is moving up another division to super featherweight on Saturday night, and his power might not have enough of an effect in this weight class for him to be a threat to Davis. Without power, Ruiz is going to get smashed quickly by Davis, and there’s not much he can do about it. If Gervonta loses this fight to Ruiz, it’s going to be a tremendous setback for him. This is supposed to be a cut and dried victory for Davis against a guy that was checked put and given the green light by Mayweather Promotions as an opponent for him. If Ruiz wins the fight, then Gervonta is going to need to rebuild his career. The good news is Davis is young, and he’ll be able to come back from the loss with the right match-making by Mayweaher and Leonard Ellberbe. It’ll still be a crushing blow for Gervonta’s career.